By now, most of us know that we have to suspend a few beliefs in order to enjoy a movie featuring a super hero. The beliefs of say, physics, gravity, chemistry, and logic, just to name a few. I’m completely fine giving up all those notions as they relate to the super hero in question, but here’s my problem: when a super hero movie is rooted in reality (as so many now are, thanks to Christopher Nolan and his truth-seeking ways), then why is reality completely disregarded once the super hero attains his powers? 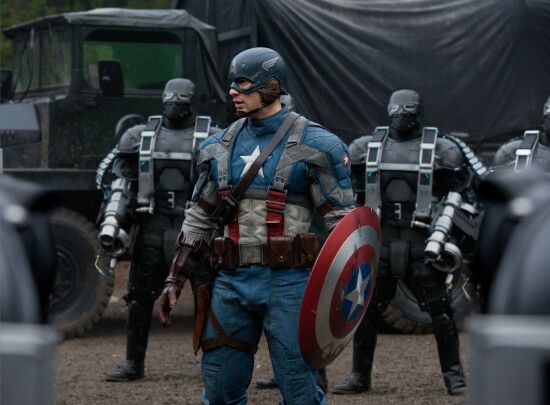 If you like these sorts of films, then you’ll undoubtedly enjoy Captain America. You’ll enjoy, yet again, another weakling-to-global-hero story, another the-geek-gets-the-girl quest, another look-I-just-discovered-my-new-powers montage, and so on. Me, I need them about as much as I need a Katy Perry song, which is to say, not at all. So when I walk into a flick like Captain America, I’m more than willing to suspend the fact-based scientific notions mentioned earlier, but I do feel the need to nitpick. Captain America begins at the dawn of America’s involvement in WWII. And while every able man is enlisting, scrawny asthmatic Steve Rogers (Chris Evans, rail-thin behind Benjamin Button-style computer graphics) can’t fight against the spread of Nazism due to his diminutive stature. He is soon recruited by a German scientist (played by American Stanley Tucci) to undergo an operation that involves a lot of injections of blue liquid, thus becoming a “super soldier.” After the operation, Rogers, now big and strong and fast and able, is soon off saving the world by stopping a rouge Nazi (played by Brit Hugo Weaving… why weren’t German actors cast in the German roles? I suppose Christoph Waltz is through playing Nazis). Now, before Rogers’ transformation to Captain America, the film itself appears to be rooted in some sort of reality, or at least the hyper-stylized one that director Joe Johnston (Honey I Shrunk the Kids, Jumanji) is often so fond of. War bonds are sold tirelessly, soldiers take orders from commanding officers, military operation rooms appear to be, kind of, normal, etc. But once Captain America starts flinging his giant shield around like a fatal Frisbee, all logic is suspended. Suddenly, every room involving military action is some sort of giant fortress, soldiers disregard orders like kids ignoring the dinner bell, and everyone who is associated with Captain America is as invincible as he is. Note: The best part of Captain America takes place after the credits, so stick around. Hmm. I want to see everything in the leadup to The Avengers, but if this film is mediocre I might have to wait for the DVD. Not worth spending the money for something that's only okay. I think you're fine waiting for DVD. I didn't have enough space to mention this but the special effects are AWFUL. Some of the worst I've seen for a major motion picture in the last few years. Except making Evans look all small, they did a good job with that. The only aspect I didn't enjoy suspending my disbelief on was the fact that he was super-powered IMMEDIATELY after the procedure. The same thing bothered me with Wolverine (among many, MANY other things). The film that does this really well in my opinion, oddly enough, is The Matrix. Kind of a totally different situation, but when Neo is removed from the Matrix it takes him a while before he recovers. I would have preferred seeing Cap recover a bit before swimming as fast - no, faster - as a submarine. I'm rambling. Oh and I did really like the film. Can't wait for The Avengers. Ramble away. There's only so much you can write in a review, but I agree with everything you mentioned. And yeah, that Bucky dude... I suppose they had to off one fella. That way we get to see Cap's vulnerable side. Sitting alone in a bombed out bar in a bombed out city only to be joined by Peggy, who apparently had virtually no problem locating him among the rubble. I agree with many points you brought up. Hugo Weaving's accent was quite distracting, and someone else should have definitely gotten the role. It was annoying when all of the POWs that Captain America broke out suddenly could annihilate a bunch of soldier with advanced weapons. I did, however, enjoy the film overall. Nice review, though. This one is pretty good. I liked it, but the sequel... I liked it more! Its like a spy thriller film with Robert Redford and Samuel L. Jackson. Sold! It have better humor and my expectations were pretty low because of the Russo brothers, but I was happy at the end. What did you think about Captain America:The Winter Soldier? If you had not saw the sequel yet and you didn't like the first film you shouldn't see this one? I did like some of the supporting performances in the first one. I actually had to turn Winter Soldier off, it was just too silly to me. I couldn't get into it.